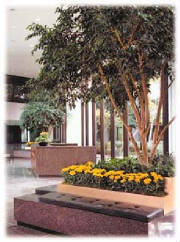 Aesthetic Plant Design has been providing flowering plants, trees, and foliage to company offices, hotels, restaurants, retirement centers, atriums, lobbies, retail stores, and other commercial spaces since 1983. Design a flowering-plant and accompanying foliage package to meet your particular budget. We are aware of your budget constraints! Provide a steady, reliable weekly maintenance plan, arriving at your office at the same time every week. Our full-service plan is fully guaranteed against any plant that fails or is infested by pests. We are covered by commercial general liability insurance for your peace of mind. We can provide a variety of other services to meet your needs, including "take-over maintenance" of your existing plants and the one-time sales of plants and containers. Not only do we provide interior and exterior plant service, but we work with your environment and budget to develop an overall interior plant design. For full details on all our plans, see our Services page. We also delight in providing Holiday arrangements for the end-of-year season. For a full description of our service and to see pictures of some of the many types of trees and foliage we can provide, see our Holiday Decorations page for details. Contra Costa county (San Ramon, Orinda, Lafayette, Moraga, Walnut Creek, Concord, San Pablo, Richmond, El Cerrito). Plants can help clean the air in your office! 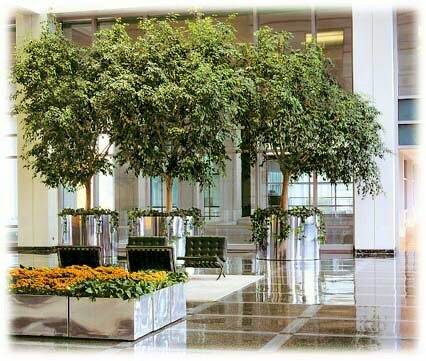 If the quality of the air in your office or commercial space is poor, then the liberal use of plants may be of help. While researching various methods of cleaning the air in space vehicles for extended periods of time, the National Aeronautics and Space Administration (NASA) found in several different studies that many common plants help fight indoor pollution: They are reportedly able to partially remove harmful substances out of the air through normal photosynthesis. As a guideline, one NASA study recommended using about 15 plants in 6 to 8-inch containers to improve the air quality in a 1,800 square foot area. 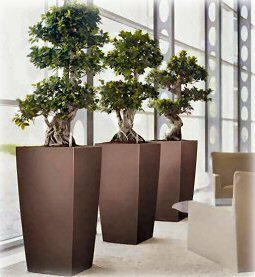 Similarly, a 450 square-foot office would need about 4 such plants. Since most of these are non-flowering, you may also prefer some flowering plants in addition. If air quality is a problem for you, we may be able to help mitigate the problem.